Although I enjoy making my sock opera monkeys and other monkeys inspired by fictional characters from theatre and books, sometimes I want to make one to commemorate or celebrate other inspirations. A little over a year ago, my partner Rolland had to have open heart surgery. He had a history of heart disease, and had suffered a heart attack five years earlier. Between then and a blockage problem a year and a half later, he already had eight stents, and the doctor felt a bypass to restore blood flow to an area of his heart that didn’t appear to be getting any was his only option. We were scheduled for surgery at the UW Regional Heart Center on a Monday morning in mid-June, and had met with his awesome surgeon, Dr. Daniel Rabkin. The doctor told us what to expect during surgery and the 5 to 7 day post-op recovery at the hospital. We notified family, and got ready, which really means I had no idea what to do so I went on a manic house-cleaning frenzy. I said it was to prepare for Rolland’s mom and sister who were coming into town for the surgery, but in reality I was totally freaked out and just needed to stay busy. Rolland stayed calm, but underneath it he was pretty scared, and my crazy cleaning wasn’t helping the situation much. Rolland was pretty sick – something we didn’t realize until after the fact, but there was a tip-off when he suffered another heart attack between his pre-surgery testing on Friday and the surgery Monday morning. When he was being prepped for surgery that morning, I was trying to be strong, but I had no idea if it might be the last time to see him. I just smiled a lot, told him I loved him and when they wheeled him out, told him I’d see him soon. The surgery went OK – Dr. Rabkin said he had completed two bypasses, but wasn’t entirely happy with the results. Rolland was doing fine and we’d be able to see him soon. About four hours later, the doctor returned to say that it appeared one of the bypasses was not working at all, and he thought the best option was to return to surgery for another operation. As power of attorney, he needed my permission for the second surgery – YES! Several hours later, an exhausted doc returned to tell us things looked great, with the help of a colleague they’d restored blood flow to the heart as he’d hoped to and Rolland’s heart was in better shape than it had been in years. I think I cried, but I know I felt like the weight I’d felt pressing down on me during the weeks leading up to this was gone. Now to get Rolland strong and back home! We weren’t exactly out of the woods yet – there were complications in recovery and Rolland’s 5 to 7 day post-op lasted 17 days. There were also two more unexpected hospital stays that summer as he continued to heal and get stronger. At this point, Rolland’s care was in the hands of his cardiologist, but each time Dr. Rabkin checked in to see how he was doing. He is a kind, brilliant and humble man who saved Rolland’s life, and thanking him a billion times just didn’t seem like enough. Enter the sock monkey. 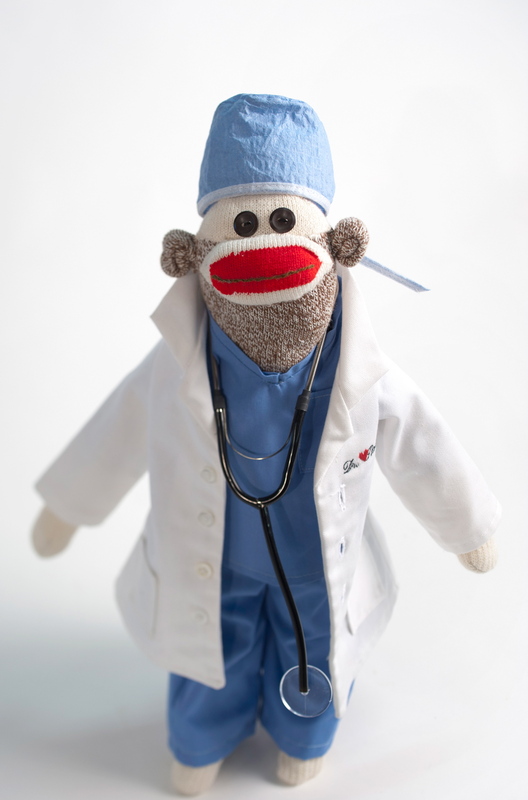 I had a blue and white sock I wanted to use for the monkey, and I knew a surgeon costume would be easy – I picked up some scrubs “for authenticity” at the thrift store, and a friend who works at Children’s Hospital got one of those surgical hats for me to use as well. 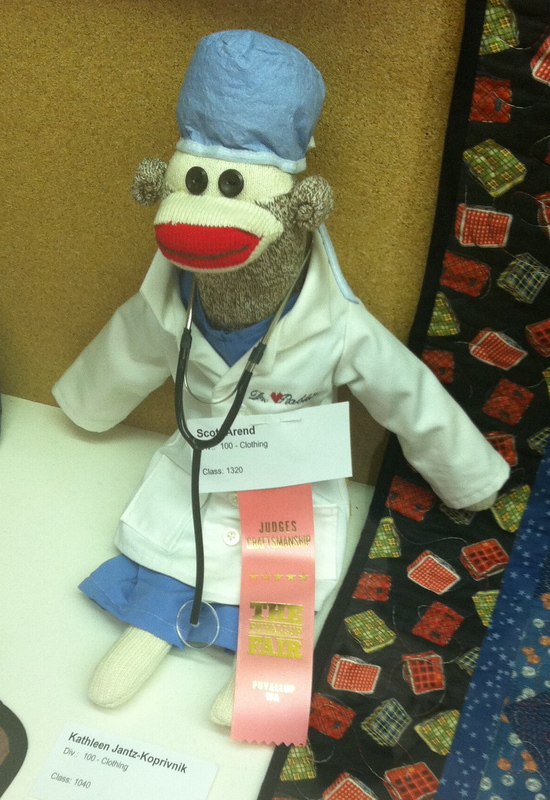 Rolland’s mom has one of those fancy embroidering sewing machines, so I got her to embroider the lab coat with Dr. Rabkin’s name, and my final accessory came from ebay – a sock-monkey sized stethoscope. The finished result is probably not the usual gift a world-class surgeon receives, but he fixed my patner’s heart and I couldn’t think of a better thing to do than give him a gift from mine. P.S. – I entered the Dr. Rabkin monkey at the Western Washington State Fair (the Puyallup) this past fall – I’ve entered embroidery pieces and Christmas tree skirts I’ve made in the past, so this was a departure for me. The good doctor earned a “Judges Craftsmanship Award”! He was displayed with a hand-made wool rug of sock monkeys that was really amazing – thanks again Doc! This entry was posted on February 25, 2012 by scootrah. It was filed under Uncategorized . I LOVE THIS Scott! Well done. What a perfect and appropriate ‘thank you’. Absolutely fantastic and wonderful! You are a treasure.